Recently I wrote a little note for our dear brothers and sisters at the Pollination Project about the gardening experiments I was part of in India. This was a nice opportunity to remember some of the learning I got there and I am integrating in my life. 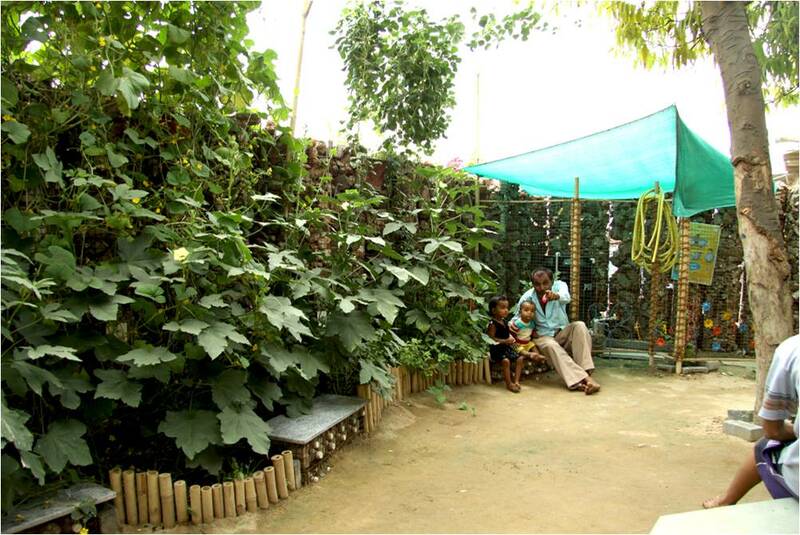 It all started with the simple idea of creating a small kitchen garden in the Gandhi Ashram, Ahmedabad. Few volunteers at Manav Sadhna started this very first little and humble gardening experiment which opened many gates we couldn’t expect. For us the experiment was an opportunity to transform ourselves in the process. Personally I was aware of a lot of the limiting habits of my own mind and the trip to India and the Gandhi Ashram was seen as an opportunity to modify those habits and became a better and wiser person. Other volunteers were taking the project with the same intention. We had beautiful inner practices during those first months: mindfulness while gardening, deep listening, sitting meditation… Being in the Gandhi Ashram and being supported and inspired by Manav Sadhna we all connected a lot with the idea of “Being the change we wish to see in the World.” Or, as Einstein put it, “Being an example is not a way to influence others, it is the only way”. With that in mind we didn’t start the experiment with the intention of changing the food habits of all the community, but more with the humility of offering a concept and an example that could benefit those who were ready to embrace urban gardening. It was amazing to witness how keeping that spirit allowed many other opportunities to blossom organically. Few more spaces were offered for us to experiment with urban gardening at a larger scale. One of those was a plot located near a school and a girl’s hostel. The plot was a sea of plastic. We took almost 2 months to clean it up. Plastic bag after plastic bag. This was such a tremendous challenge for all of our fears, impatience, or anger. It was a slow process which inspired a lot of conversations with the school, with the neighbors and with few other local Non Profits involved in development work in the area. After a lot of inner and outer work we turned the plot upside down and helped the land to bloom again its natural greenery. During the process we also conducted workshops with the girls in the school and the hostel. In those workshops we discussed about a variety of issues such as natural farming, the use of plastic, the cycles of Nature and many more. We even taught the girls how to make compost and how to take care of the soil. Many of these workshops had a very practical component. We shared theory (with the help of volunteering translators) but mostly we tried to create opportunities for the girls to experiment with their hands and hearts. A lot of smiles were found on their faces during all the process. The process was challenging, especially because of the language barriers, but that challenge helped us develop the “language of love”. Connection with the girls was great. At the beginning they were reluctant to open themselves much to us, especially to the boys, but after sometime they became more trustful and opened with us. Some of the international volunteers developed a relationship with the girls, that still persists today, by phone or by postcards. Also great relationships were created with the teachers and coordinators of the school and the hostel. These relationships were considered by many of us one of the greatest successes of the project. After sometime many of us felt like family. The land the first monsoon after the clean up. This experiment near the hostel opened up more opportunities to bring the project further. Organically we connected to Jyotsana, one of the coordinators of the Non Profit Gramshree. Gramshree is focused in the empowerment of women through different kinds of initiatives ranging from community centers to income generation projects. Jyotsana is the coordinator of one of the community centers for women, which is located in the middle of a big slum in Ahmedabad. When Jyotsana saw the gardens, an old dream awakened in her. That dream was to see a greener and healthier neighborhood, and women and their families having more wholesome and healthier diets. 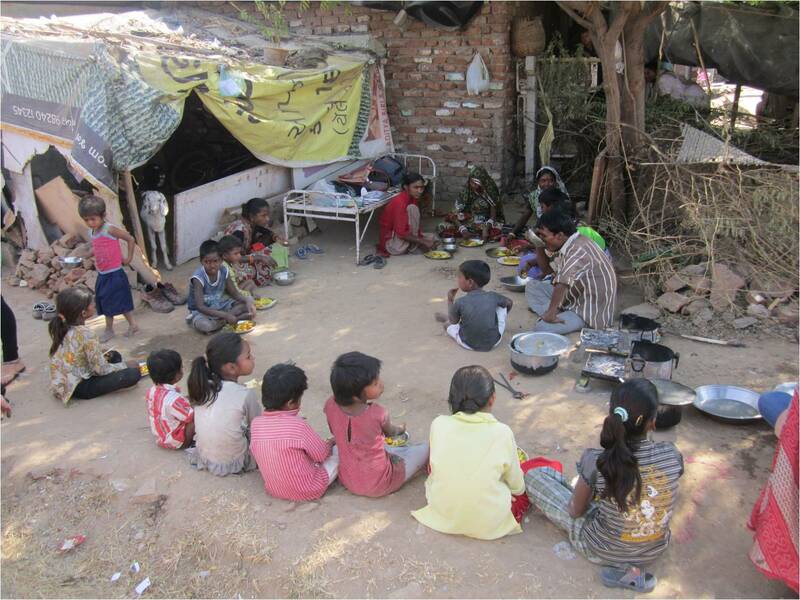 Jyotsana started to connect with the neighbors in the slum to see if some of the underprivileged families would be willing to start a kitchen garden on their reduced land. 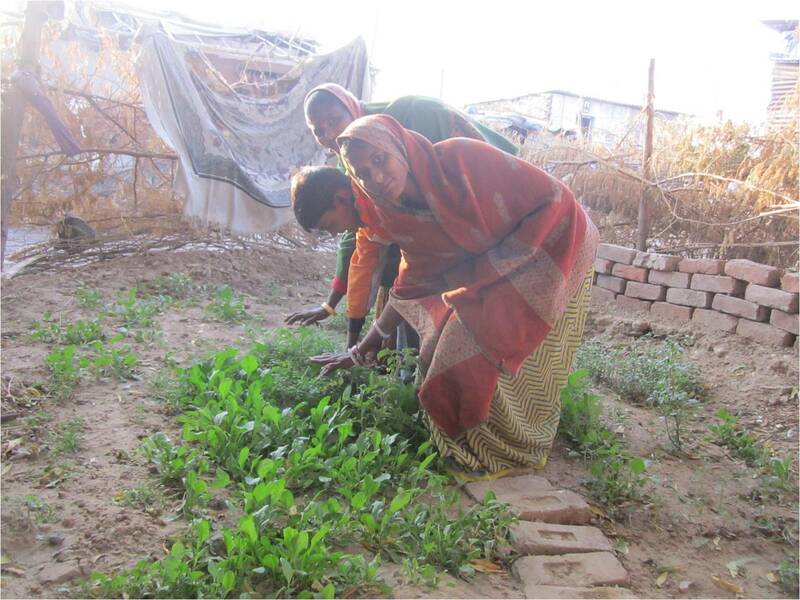 After sometime planting seeds one family decided to donate half their land (a very small plot, around 420 square feet, 40 square meters) to create a small kitchen garden. And not only that, they also decided to share their land with 5 other neighbor families. For Jyotsana this was already an incredible success. On her words, these families were not very friendly with each other before the process started. But the conversations and presence of Jyotsana started to turn around the situation. For us it was magical to see how the families came to all the circles we held to connect and talk about the project. It was also magical to see their gratitude for our work. They were also super participative. They would bring their own material to contribute and they would water the plants everyday, even if they had to walk an extra kilometer to do it. Something very powerful went on with those 5 families. I remember one of our circles. We held circles to talk about the project, but they were also intended to be spaces for communication, empathy and trust. All of us would open our hearts in many of those circles, again with the help of translators, in this case basically Jyotsana. After 8 months working together, we had one very powerful circle that could resume the “impact” of the project. It was the day when we were going to harvest the first fruits of our work. Some spinaches and herbs were ready to harvest. The atmosphere was very joyful. We had community lunch together that day. Going around the circle, there comes the time for Bhavana. She is a 35 year old woman which looks 50. Very damaged by a tough life, she was always concern about her health. She could barely eat one meal a day. I remember her telling me that many days she would eat only ice cream, since she was a beggar and sometimes people will just buy her an ice cream while doing her begging round. Well, that day she looked like a princess of heaven to me, and to all of us there. With tears in her voice she told us that she wanted to give the first harvest to us the volunteers. Amazing. Probably words cannot describe properly what we all felt in that moment. Radical Generosity we may call it. Like the lotus flowers in the mud, human goodness can blossom even in the worst environments and the toughest conditions. This example of radical generosity was not isolated during our interactions with these families. They were constantly opening their lives and hearts to us, wellbeing foreigners, without a trace of negativity; rather they gave us love without measure. Our first terrace garden. Wonderful Uday’s family. 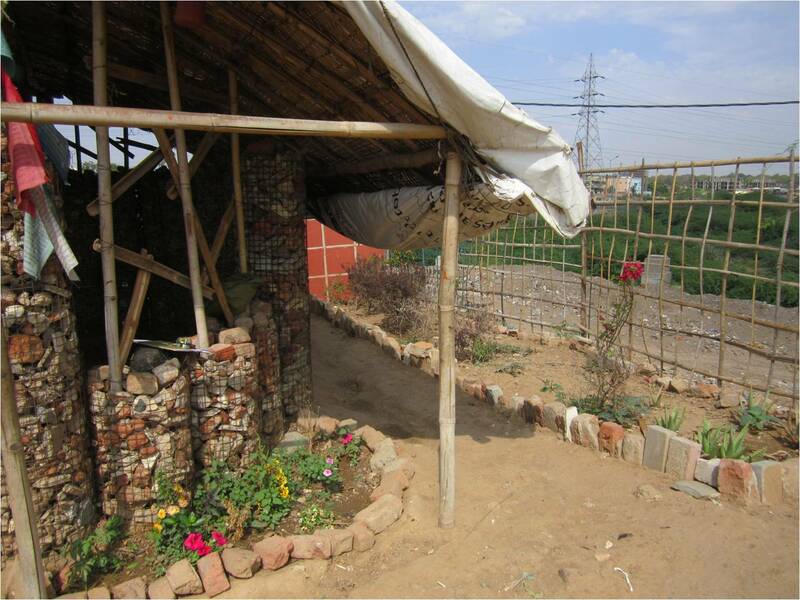 Uday was inspired by the project and he wanted to experiment the beauties of a kitchen garden on his terrace. This well accommodated family was very inspired and moved by the volunteers who offered their work as a gift. Udaybhais’ father was doubtful with the idea of having a kitchen garden on the terrace, but at the end of the procces he told Udaybhai: “You should go out there and serve people as these volunteers are serving you”. 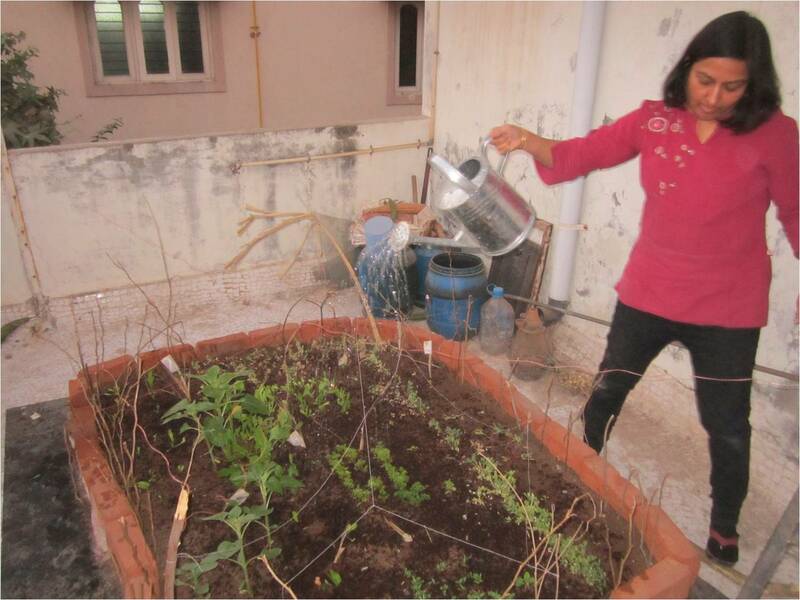 Kitchen Garden for blind kids! The blind school is a beautiful project, born to protect and nurture underprivileged blind kids of Gujarat. Inspired by the project they also decided to start their own garden for kids to enjoy and learn. It was beautiful to work with them for few weeks!! What have you learned about yourself and/or the world as you’ve worked on your project? Well to say that my life has completely changed would be unfair. My life has been Bulldozed by Love. Nothing is the same after Indian experience for me. I am still digesting many of the learnings and experiences I had there. Maybe the greatest teaching has been to learn to focus on inner transformation, inner happiness. I went to India with the intention of changing myself, but when you see so many “problems” around you it is difficult to restrain yourself from trying to solve everything. But the thing is that our physical body has its own limits and in fact, we cannot reach everywhere that way. But in India I realized that there is a way to reach everywhere. As we progress in our path of inner transformation the world starts to knock at your door, and slowly, every breath you take starts to be of service, almost unintently. I lived with people who have already mastered that art. Jayesbhai or Nipunbhai are fountains of love who offer shelter to all kinds of pilgrims of life. Very effortlessly, or at least this is what appears to be, they serve with every breath, they change the atmosphere into one of love, unity and care. For me, there is no better way to be of service. And this happens from inside out. Only a clean pure heart can generate such conditions around it. And this is where I am at now. I want to be a mattress of soft feathers for people, a space where people feel happy, loved and cared. I am still far from the mastery of it, but as Gandhi put it, “full effort is full victory”. I am now spending few months at a Vipassana center near Barcelona, deepening my own transformation and hoping I can reach those picks of Love I have witnessed in India.